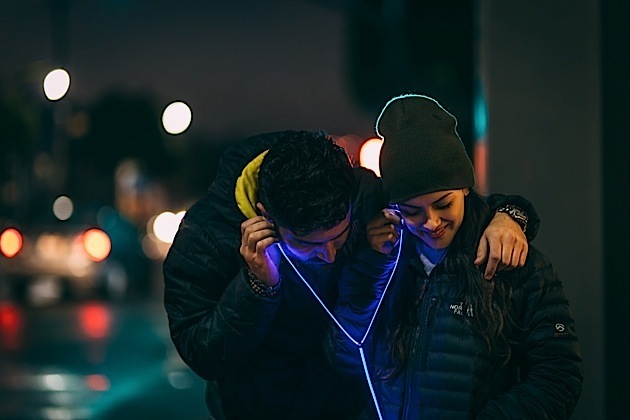 At first glance, a pair of Glow headphones might seem like gimmicky glow-in-the-dark earbuds that are designed to get your attention and not much else. 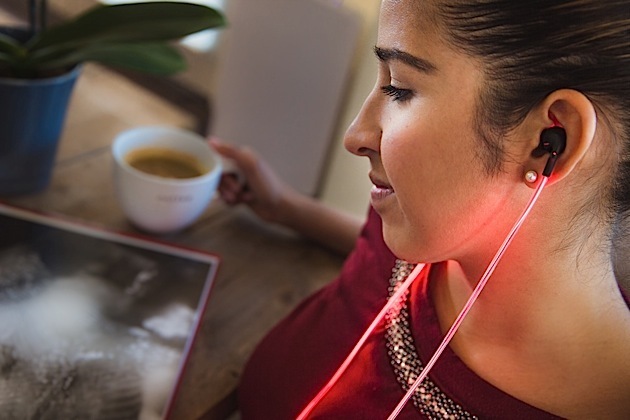 But look a little closer and you'll find something a whole lot more interesting: Glow purports to be the "world's first" pair of smart headphones embedded with laser light. Yep, that Tron-like glow from the cable emanates from something called Fibrance, a special light-diffusing fiber from the folks over at Corning -- you know, the same folks who make that Gorilla Glass stuff. As for what makes it so "smart"? 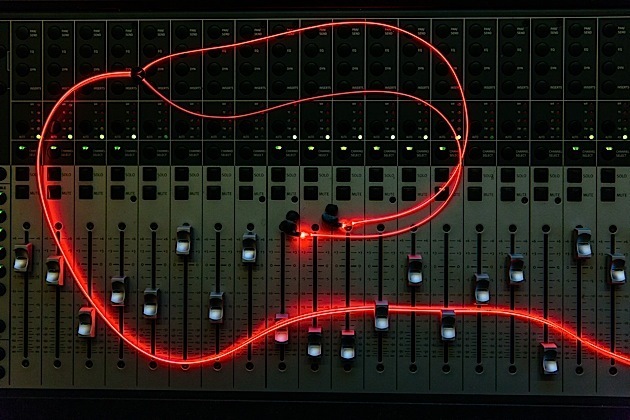 Well, the colored light of the cable isn't static -- it actually pulsates to the beat of the music. And, if all of Glow's Kickstarter goals are met, even to the beat of your heart. But that isn't the only thing that makes Glow so unique. Glow is also one of a few pairs of headphones that are designed to be compatible with Android right from the start. "Android never had a dedicated audio accessory," says Zi Wang, the man who came up with the idea for Glow almost two years ago. Wang would certainly know a thing or two about this -- he's currently employed at Google and has worked closely with the Android team. Though he invented the concept, however, Wang's role in Glow is mostly an advisory one, leaving most of the operations up to a team he built himself. Leading the team is Rafal Zboinski, an engineer with a long history when it comes to research and development in both hardware and software. Interestingly, the Glow still hooks up to the phone via the regular ol' 3.5mm jack. With Bluetooth LE, why not just add stereo Bluetooth to the mix and remove the need to be tethered to the phone altogether? That's because if the battery ever goes out, you can still use the headphones as just regular headphones. "If the battery goes out on a 15-hour flight, you can still listen to music," says Wang. If it was wireless, you'd be out of luck. 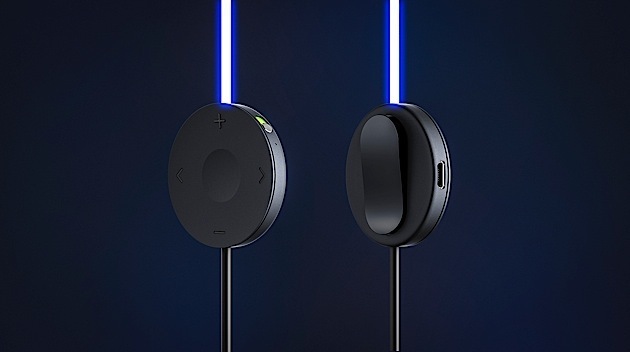 Still, Wang says Glow will offer eight hours of continuous use and the team is currently developing an attachment to extend the battery life if necessary. In the end, Wang wants Glow to be more than just a pair of headphones. He wants them to be in the wearable category too. But while earbuds like the Bragi Dash are focused more on fitness, he wants Glow to be more about lifestyle, emphasizing utility and usability. "Our heart-rate sensing and ability to express that, is about expression. When you're out running, you can see the light pulse faster according to the rhythm of your heart ... If it senses you're in a calm mood, the pulsing will slow down." There'll be a binary switch that lets you choose whether you'd prefer the light to pulse to the rhythm of the music or to your heartbeat. Wang wants Glow to have a beautiful aesthetic, but he's also careful to make it out of quality materials. That aforementioned d-pad is made out of a soft polycarbonate, and the housing of the light fiber is wrapped in a TPE material that he says will ensure the cord will be free of tangles. As for colors? They'll be available in red, green or blue -- sorry, no RGB color-switching mode yet. Oh, and there's actually a story behind the choice of the Fibrance material itself. Two years ago, when Wang came up with the idea, he wanted to use electroluminescent light cables. Indeed, he was so far along in the creation process that he had already made prototypes and filmed a Kickstarter video for it. But he came across the Corning Fibrance material by chance at an event, and was so enamored by the technology that he had to make the hard decision to scrap the entire thing and start from scratch. They were only two weeks from launching, but he says he had to do it. It was a good decision in the end, he says, because between then and now, they've also integrated other important features like Bluetooth, the beat analysis and a much lower-power chip (an ARM Cortex-M0, if you're curious). I had a chance to try out a working prototype of the Glow headphones, and while it's difficult to truly judge the audio quality in such a brief amount of time, I came away impressed. It was neither too bass-heavy nor too treble-heavy, striking a nice, rich balance between the two. The light, as advertised, did pulse according to the music, but not in a heavy staccato like I expected. Instead it sort of ebbed and flowed with the song, almost like a roller coaster of rhythm rather than anything that flashed or blinked (which I imagine would be far more annoying). It seems like a neat feature, but in all honesty, I'd probably feel really self-conscious wearing such an eye-catching thing out in public. Alright, so what's the damage? If you get in on the Early Bird Special, a pair of Glow headphones will set you back $127. Wait a little longer, and you can snag one for $149, which is a special Kickstarter price. It's certainly spendy, but that's about on par with most premium headphones. There are also a couple of big-ticket Kickstarter packages -- the $1,000 developer kit will get you an SDK, while a $4,000 backing will get you and a friend invited to a special electronic dance music event in Las Vegas, appropriate accommodations, plus three different Glow headphones. It's worth noting here that certain features require the Kickstarter to hit certain stretch goals. iOS support will need $500,000; the ability for the Glow light to dance to steps and movement will need $750,000; and that cool heart rate monitor thing? That will require $1 million. Photosynthetic sensors don't come cheap.